Why would you ferment tomatoes, and what would you normally use it for (assuming it wasn’t over-salted)? Flavor. A cooking ingredient (or a bloody mary). 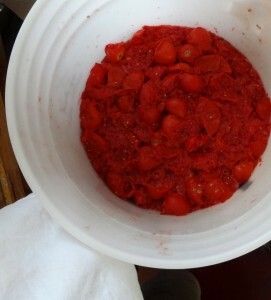 Could you preserve the tomatoes whole or slightly blended instead of separating out the skins and seeds? Yes, you could ferment them whole or crushed. 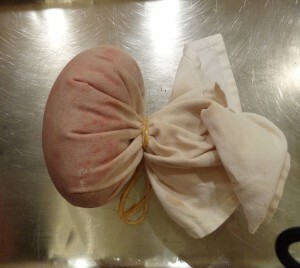 If whole, you’d need to add sufficient brine to submerge them, and once they split open, the ferment would be very watery (diluted flavor). 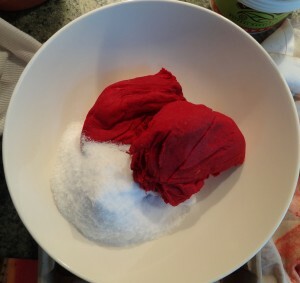 If your intention is to preserve the integrity of the tomato, either prick or halve them, then salt and let the brine form from their own juice. Sandor here. I hear what you’re saying about how salty it is, but it also seems shelf stable for months without any molding as a result. Lower salt would definitely taste better, but also be less stable and possibly prone to molding. I think of this intense concentrate as tomato miso. You need only a tiny amount because it exerts such intense and concentrated flavor. I agree. 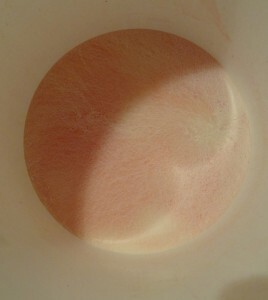 No hint of mold, or any change in color or flavor after 6 months on the shelf (without refrigeration). Great post! Reading it, I got a really whacky idea – maybe you could do the same thing with rosehips? Rosehips have been extensively used in sweets and desserts, for a long time, in Sweden, which is my homecountry. However, your tomato preserve contain 25% salt and I don’t see much use of something, with a salinity of 25%, in sweets and desserts. Hence, I’m wondering if you could switch the salt for sugar? They’re both great preservatives, though, of course sugar is very fermentable, unlike salt. However, considering that the preserve would be in solid form and would be kept in a refrigerator maybe the fermentation of the sugar would be so slow that it wouldn’t be noticeable? Or maybe I could just skip salt or sugar and ferment the rosehips alone? You could certainly do the same ferment with rose hips, then you’d need to experiment with how to best use it in the kitchen, since it would probably be unlike other preserved rose hips you’re familiar with. And you could start out with less % of salt. Many desserts here in the US are prepared with an increasing amount of salt, and with specific salts as an ingredient or topping (like smoked salt crystals on chocolate covered caramels). I rarely use salt when I cook, and when I do, I nearly always use miso paste (or tekka miso). Even for pie or fruit cobbler, I use a sweet millet miso made with vanilla salt, since it always adds another rich and somewhat savory component which is particularly tasty. Sugar and salt can both be used to preserve foods, yet when used in a ferment they attract different communities of organisms, and different flavors. For example: In the absence of oxygen, yeast metabolizes sugar and produces alcohol rather than CO2, and we get wine. If oxygen were present, bacteria would colonize and produce acetic acid. In the presence of salt, the sugars produced by the koji enzymes acting on the carbohydrates from the beans in miso cannot be converted into alcohol, so we get tamari. Good luck and let us know how your rose hip experiment turns out. 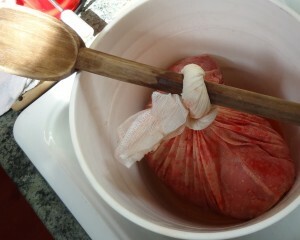 Yes; depending on what you ferment, you’ll need a crock or vessel. I think that will be made clearer as you read Sandor’s books. Has anyone fermented a tomato ketchup? Yes, and it’s very simple. The WWW is full of easy-to-follow recipes. Wow, This is the first time I’ve seen anything close to the ‘coulis de tomate’ that my mother-in-law used to make here in Provence! What you do is exactly what we used to de here. 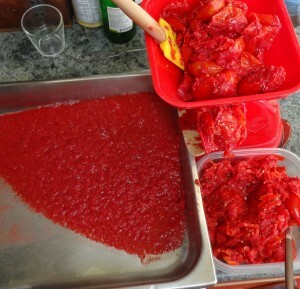 Except to perserve the coulis, we cover the tomato paste in olive oil. If the air can’t get to it, it will last for at least the season and the flavour is just amazing during those winter months when tomatoes are tasteless and sad! Bravo!! Is there another post regarding the leftover liquid? How much longer did you ferment it? Did you add salt? Can you use it like whey? 1. See the post on fermented Bloody Mary cocktails. 2. Anywhere from 1 month to 1 year, or longer. 4. I’ve never used whey for fermenting (or for any other reason) so I cannot answer that. Thank you so much for all the clear answers!! 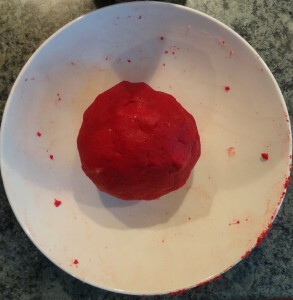 It sounds silly asking about the salt, but I had started this using another recipe and there was no salt added until the end, kneaded in to the pulp. Going to the cocktails posts immediately. Sounds delicious. What was that device you borrowed from your neighbor? I have no idea and wouldn’t try this without knowing how I could separate the pulp. thanks. I loved your bloody mary recipe. Question about the white mold you found in the crock and stirrd back in everyday. I am on day five of the ferment and have seen no mold of any kind. I think I am almost at the stage of straining off the liquid but hesitate. My only thought is that it has been colder than usual this last week (mid 60- low 70) and maybe my ferment is just slow. Is the presence of the white mold nessisarry? The only microbiological presence that is necessary are the lactic acid-forming bacteria. No others are required, and cooler ferments have fewer unwelcome molds. Mold is not necessary. Consider yourself lucky and don’t hesitate. What percentage salt is to low? Could I get away with say 10-12%? I cannot say how low is too low on the salt concentration. The batch I made was too salty, and if I were to make it again, I’d definatly lower the salt. Feel free to give it a try and let me know how it turns out. In my experience, using a lot less salt is fine, so long as you’re going to eat the batch soon. My wife’s father, a cardiologist, maintains that in all culinary matters, using lemon allows one to use less salt. This is especially true in fermentation. The highly acidic lemon juice will pick up the salt’s antimicrobial slack, giving you greater flexibility. Rather than top off my fermented tomatoes with brine, I use lemon juice. It adds a nice fresh aroma and flavor while keeping the saltiness down to pleasant levels. Question about fermentation time: After 6 days there is still fermentation going on. is this Good or bad? It smells good though. Do I leave it untill there is no more bubbling? Don’t worry if it’s still bubbling/fermenting, it will take as long as it takes. Trust your nose, and you don’t need to wait until it’s ‘done bubbling’ to use and enjoy it.